Two different movement and healing methods both using the word “restorative”. While restorative yoga is something that I teach as its own class, restorative exercise is training that I’ve taken that provides a foundation for everything I teach. The two methods are explained in more detail below. Restorative Exercise is a whole body alignment and movement program that applies the principles of biomechanics* to determine where a client’s particular habitual movement patterns have created imbalances that have contributed to conditions such as pain, osteoarthritis, pelvic floor disorder, diastasis recti, poor balance, and digestive disorders. Restorative Exercise uses a series of corrective exercises to stretch and strengthen muscles, bring the body back to optimal alignment, and restore functional movement patterns. In so doing, Restorative Exercise works to address the poor movement patterns that lie at the root of many health conditions, rather than treating the symptoms. * Biomechanics is a science that looks at how the structure and function of biological systems are affected by both external and internal forces. How you align and move your body, combined with the effects of gravity, has an effect on the health of your muscles, bones and other tissues, organs and systems (digestive, reproductive, etc.). Restorative Exercise is a whole body alignment and movement program, developed by biomechanist Katy Bowman that uses specific objective alignment markers that can be applied to any person to determine where their particular habitual movement patterns over their lifetime have created areas of weakness in the body. The program then uses a series of corrective exercises to address muscle imbalances and return the body to functional movement patterns to reduce pain and other conditions. optimal cellular health for all of the body’s tissues. Cellular health is achieved best when there is no restriction to the optimal flow of blood (oxygen to cells), lymph (cellular waste), and electricity (nerve/neurological flow). By working to increase flow to all of the body’s 600 muscles (not just the big muscles used by your favourite sport), Restorative Exercise seeks to improve one’s quality of life (living pain, disease and medication free) for the long-term. Having optimal health as a goal makes this program different from other fitness and exercise programs that often have a particular performance goal (e.g., to run faster; to lift a greater mass; to run further, etc. ), or seek a particular health measure (e.g., increase VO2 max.) or a particular aesthetic outcome (e.g., wanting the body to look a particular way). With the Restorative Exercise system of objective alignment markers you will be able to see where range of motion is limited, restricting flow and creating joint friction; and where range of motion is greater than your ability to control your stability for the health of your joints. With the corrective exercises you can acquire new motor skills, find strength, discover your compensation strategies and return to functional patterns of movement. Restorative Exercise is also about finding ways that you can incorporate healthy movement throughout your day rather than dedicating a specific hour for exercise while remaining mostly sedentary for the rest of your day. Some common habitual movement patterns in our society are created by a lifetime of wearing rigid shoes with a rise in the heel, sitting in chairs or at desks for many hours of the day, infrequent walking, and favouring a particular form of exercise or sport repetitively. Working to change the way you move can have many positive and life-changing effects, helping to restore health and decrease pain. 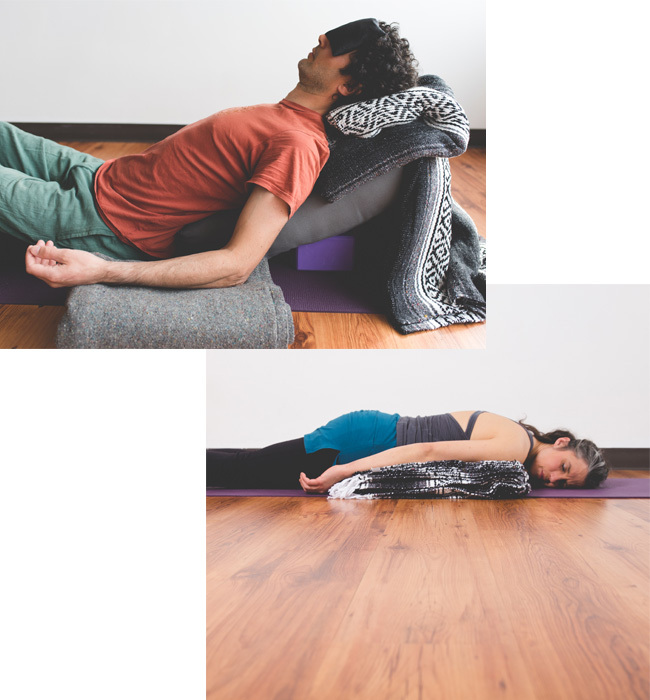 Restorative yoga is the yoga of relaxation. Instead of using active yoga postures as found in other forms of yoga, in restorative yoga the body is placed in positions that are receptive. These positions are supported by props and are held for 5, 10 or even 20 minutes. This is a powerful practice that is designed to elicit the relaxation response and promote deep mental, physical and emotional healing. In our modern lives it appears as if stress abounds. Stress is not a “feeling” or a “state of mind”. Stress is a physiological response to what your body and mind perceive as threatening. Once you perceive a threat your brain signals a complex series of hormonal interactions that give rise to the “fight or flight (or freeze)” response of the sympathetic nervous system. Blood moves faster to the heart, muscles and vital organs and is shifted away from non-essential systems (like the digestive system). From an evolutionary perspective, this stress response helped us escape or respond to real and life-threatening danger. When the danger passed, hormonal levels returned to their resting state and the parasympathetic nervous system (responsible for “rest and digest”) took over. In today’s world many of us are activating our stress response for situations that are non-life-threatening (a job we don’t like, running late for an appointment, family difficulties, or feeling overwhelmed with our “to do” list and time). In addition, we are experiencing chronic stress, maintaining the activation of our “fight or flight” response. Over time, continued levels of stress hormones can cause our health to deteriorate and contribute to a variety of health conditions such as cardiovascular disease, high blood pressure, insomnia, decreased immune function, diabetes, memory loss, depression, fibromyalgia and digestive disorders. The remedy for chronic stress is relaxation. The “Relaxation Response”, coined by Dr. Herbert Benson, is the physiological and mental response that occurs when a person consciously relaxes. It is the body’s ability to experience a decrease in heart rate, breathing rate, blood pressure, and muscle tension. Regularly practicing relaxation techniques that elicit this response can help to reverse the emotional and physical effects of stress. Specific benefits include reduced anxiety, improved concentration, increased energy, improved sleep, and benefits to your cardiovascular, immune and digestive systems. Practicing relaxation is not about making your problems go away; it is about altering how you respond to them. Practicing relaxation on a regular basis can help you change how you perceive stress and create the conditions necessary to maintain your ease.